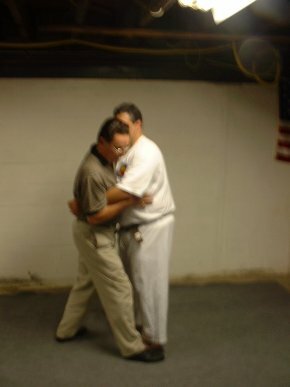 One of the major things that I have continually stressed about street self defense situations is that they "just happen". That is to say that you are given little if any indication of trouble or time to prepare. All of a sudden you find yourself in the middle of it. And you find that you are belly to belly rather than eye-balling each other from a distance with the opponent calling you out. You are forced into immediate action. One such scenario finds you faced with an opponent quickly closing the distance on you. I train my students that if closed on so quickly that the opponent enters your hot zone that you must immediately strike and move into the attack. You do not want to move away from the attack as that only allows the opponent to build up more momentum (i.e. mass times velocity) against you. In this type of situation, your strike is most likely going to be a tate (short punch) to the floating ribs or solar plexus. Figure 1 shows this. Now what? First, realize that neither of you is stationary. Both of your forward momentums are continuing. Thus, I teach using a good ol' fashioned "body check" to throw the opponent off center. Even a small person accelerating their hips just below a much larger opponent's waist can create a tremendous shock effect. The laws of physics tell us that even in such "in-elastic collisions" (as opposed to two billiard balls colliding) each colliding body will be repelled back away from collision. This provides us with an opportunity to lock up the opponent's arm, as shown in Figure 2. 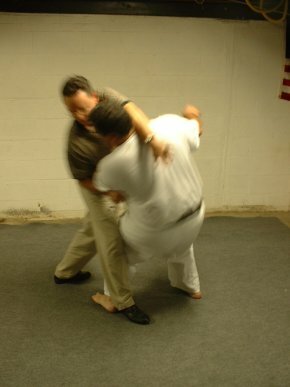 Continuing to use the principle of "action/reacation", the act of locking the opponent's arm up will again cause the two bodies to experience another in-elastic collision. You use this to again body check the opponent, this time using your action arm's side leg to wrap around the opponent's, and setting your opposite arm up for a fluid shock. This is shown in Figure 3. Figure 4 shows me executing the fluid shock. Note that when you now throw the fluid shock strike, that you do not do it upwards at the opponent's brachial plexus but rather down and into it for reasons similar to why we do the Roundhouse Punch the way that we do in the Basics. This sequence is shown in Figures 5 and 6. 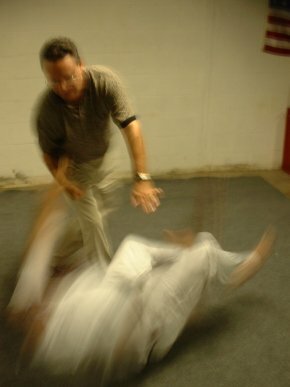 Note how performing the technique in this manner actually "drives" the opponent down to the ground. From there, he can easily be further disabled, hooked up, or backed away from. 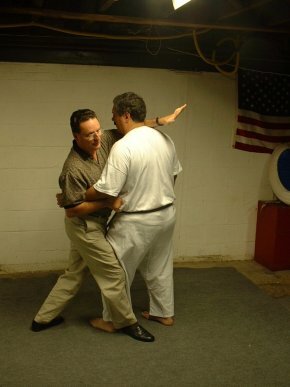 Grandmaster Peter M. Rose holds an 8th Degree Black Belt. He began his studies with Grandmaster S.A. Brock in 1968. 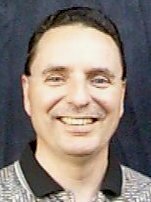 He has operated the Rose School of Karate in Portsmouth, NH since 1972. Grandmaster Rose is a senior software analyst, designer, and technical project manager. 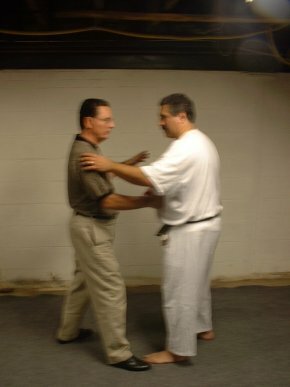 Grandmaster Rose can be reached at zzrose@yahoo.com , or you can visit his personal web page at http://www.zzrose.com/pmr.html. I recently had a great weekend with my Green Belts and Higher ranking students. The Theme of the Day was Responsibility. Although most everyone understands the word, most never apply it in their lives. I was quite adamant in telling my students that if you say you understand something, or a statement seems obvious to you, then you must apply that to your lives. If you read much philosophy you can come away with the idea that the words are obvious and that you understand what you read. Well, our BST is like that. Many of the words and statements make perfect sense - that's the beauty. Where it becomes complicated is our application of BST. Ask yourself "Do I accept and live by many of the statements that I have learned?" True understanding comes from accepting the responsibility of applying truths in your life. Let me discuss the meaning of responsibility. Responsibility is recognizing that you have to reclaim charge and care for your life and the situations each and every day. Taking responsibility is answering for one's own actions and obligations. Our BST states that you are a product of the way that you think; therefore, there is a potential to drift along in life guided by simple emotion and learned behavior. If you do not feel that your life is heading in the right direction, then you have to assume personal responsibility to make your life better. Once you accept that you are a product of the way that you think then you will be able to take charge of your actions and feelings and change the way that you think in order to make your life better. Why is assuming responsibility difficult? When you recognize that how you feel, what you do and who you are all come from your own actions then you can no longer blame anyone else for these things. In a society where people want to blame "someone" when something goes wrong, you might be able to see why people don't step up to accepting blame. Remember the world famous case where a woman won a large cash settlement from a fast food restaurant because she took the cover off of a hot cup of coffee, held it between her legs and then got burned when it spilled on her? The woman did not want to accept personal responsibility for her actions and wanted someone else to blame. I realize that there are difficult events in life that affect you that you might not have caused. These situations are not always easy. Suffering does exist; however, how you respond to these events determines whether or not you will be happy. You can allow people to always control you, or, you can assume responsibility and try to control your response to the situation. This does not mean that you can control others. It only means that you can assume responsibility for how you feel and thus change your relationship to the situation. You can play the "Woe is me" game or you can assume responsibility for how you feel and then take steps to help make the situation better. As Martial Artists we want to assume full responsibility for our life. When we do - we become the driver and not the passenger. I tell my students all the time, "Be active participants in life and not merely exist." Being an active participant is assuming responsibility. Someone once asked me how I can motivate people to work out on their own. My response was that if I can get them to assume responsibility for their material then they will have their own motivation. Once you assume responsibility then you can do anything. I want to leave you with this thought on motivation. I believe you will see how responsibility and motivation go together. People are motivated when they are convinced of the correctness and the urgency of their goals to the extent that they are eager to Act, and keep Acting to reach these goals regardless of what others do or think. If you assume responsibility for your training and life then you will become motivated to do anything it takes to reach your goals. Life is good!! Enjoy it and Live it to its fullest!! 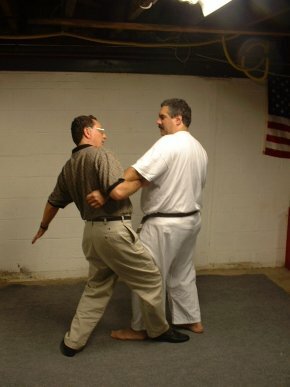 Sandan Bruce Vinciguerra is the Sensei of the Somersworth School of Self Defense. He owns Tony's Television where they specialize in the repairs of Video and Audio Equipment. He is married with 3 children and has been training in the Art for 18 years.